Healthy Juice Drink Recipes Sweet Corn .Strawberry fruit juice made ​​already common, vegetable juicing carrots are also already common, if corn made ​​juice? Now that's rich not know deh. Weve can ya? It was like what? 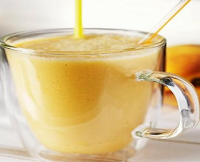 Of the many variants of fruit and vegetables that can be turned out corn juice can be juiced and unsparing, flavors created from corn blender produces delicious flavor in the juice with a blend of milk and soda, indeed ust once. Not only that, it turns out the corn juice is a typical juice drinks Labuhan Bajo, East Nusa Tenggara. In addition to delicious, tasty and fresh, corn juice is also excellent for diabetics because it can lower blood sugar levels with the course made without sugar in the juice. Start curious to enjoy specialnya sweet corn juice drinks. Peel the corn husk and clean of feathers attached to the seed corn. Boil the corn in boiling water until cooked and soft tekturnya. Lift then drain and let stand until cool. Pipil corn by hand or a comb with a knife. Puree the corn kernels in a blender. Add sweetened condensed milk and sugar then blend again until evenly mixed. When finished blend, pour into serving glasses of juice corn by means screened in advance so that the waste is not getting carried away. Add ice cubes and soda water to taste. If it is still thick, add more ice cubes. Juice of sweet corn ready to be enjoyed. Get fresh recipes and other healthy drinks only in. 0 Komentar Untuk "Healthy Juice Drink Recipes Sweet Corn"